"Dinner for Two, Tonight" is a collection of menu ideas that can be prepared and served in 30 - 40 minutes from fridge to table. I buy one of those small hunks of cured ham once or twice a year. I'm talking about the 1 - 2-pound chunks you find in the supermarket cooler near the bacon and sausage. They aren't cheap, but they are good, unlike those water-filled whole ham steaks in the same section. A 1 1/2 pound hunk is good for a couple of meals and a couple of sandwiches. So it's a great and easy start to several meals. In this menu, start the potatoes first (turn on the oven when you walk in the door, before taking off your coat), then make the glaze for the ham and the salad dressing. This meal can be ready in 35 minutes. 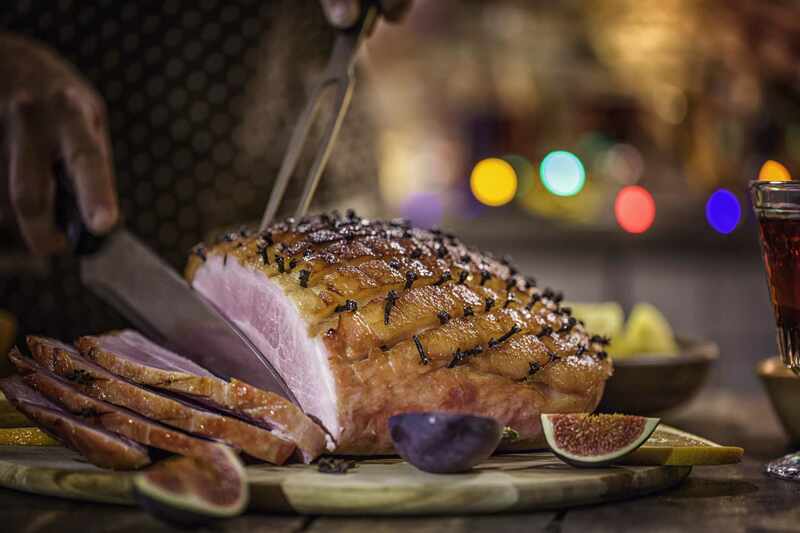 It's hard to beat a glazed, baked ham - it's also difficult for two people to eat a whole ham, however fond they are of leftovers. This recipe offers most of the satisfaction of a glazed ham without having to spend a month eating it. The flavor profile is a tasty balance of salty, sweet, hot, sour and savory and so it touches almost every taste bud in your mouth. Best of all, it's easy enough to make on a weeknight and yet fancy enough for a special occasion. Roasting intensifies the potato's sweetness and the herbs highlight it. Use herbs you have on hand and like. Sliced into thin wedges they'll roast in 30 minutes at 425 F and even the peel is good (albeit not as good as the peel on a regular potato). Get a couple of not-too-thick potatoes. They should be 6- to 7-inches long and no more than 3-inches at the thickest part. Turn the oven on the moment you walk in the house so it will already be hot. The Wedge salad I remember from my childhood has been making a comeback. It consists of a wedge of iceberg lettuce with dressing poured over it. That's it. Personally, I prefer making my own dressing (and as a kid I loved blue cheese) but these days you can find decent salad dressing in the vegetable section of the supermarket and I'm willing to admit that when I'm feeling particularly lazy I'll buy salad dressing. No recipe here. Just spread a couple of slices of pound cake with a bit of butter and briefly broil them. Smear lightly with strawberry preserves and then add a dollop of whipped cream.